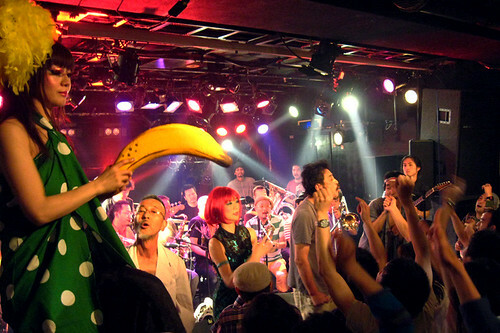 The crowd pumped their fists as Shibusashirazu started their first song, a 30 minute half-improvised jazz/ska/rock explosion with long crazy guitar and sax solos. 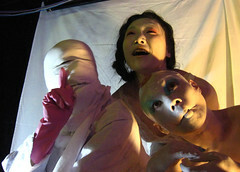 Butoh dancers appeared from nowhere on the platform beside us scaring the girls behind me. Later they played a Kiyoshiro Imawano song as a tribute to the legendary rock singer who recently died of cancer. The sound and energy was amazing coming from the middle aged guys on the stage as they played over 3 hours of fast wild rock-influenced jazz causing even the shyest audience members to dance and wave their hands in the air. I was exhausted. There is nothing like a Shibusashirazu Orchestra show. You have to experience it at least once. They are playing on Sunday May 10 (as Shibusashirazu) at O-Nest supporting moools and nhhmbase. Details. 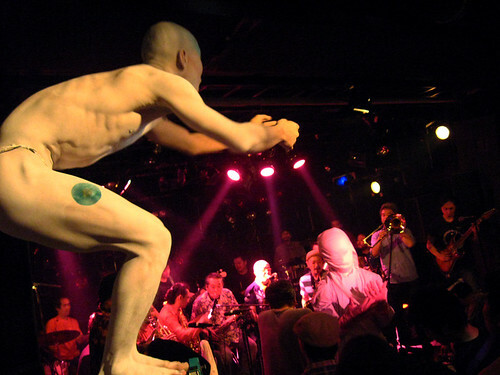 The Orchestra is also playing at Club Quattro in Shibuya on May 28th. Details. Shibusashirazu Orchestra are regulars at Fuji Rock Festival and will be playing again this year on day 3 (July 26th). Details. You can sometimes catch members of the orchestra playing at places like Airegin in Yokohama. Banana girl! Look at her go! Shibusashirazu blew my mind the first time I saw them (at a similarly monstrous 3 1/2 hour show in Nagoya a few years back), and I've been a fan ever since. I've gotta say, though: if you're going to see them, go to one of their solo shows. The condensed sets I've seen them do while sharing the bill with other bands have always been disappointing - their songs become more interesting the more they sprawl, but can sound a bit bland and conventional when forced to stick to a stringent time limit. Jrim - yeah, i can imagine the more freedom they have, they more amazing they are. the quattro show is set to be something special.